My sister-in-law is visiting. And to my amazement she grabbed some reading material before heading into the bathroom. Kinda surprised me. Why? 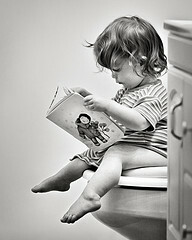 Because I think reading in the loo is more of a “guy” thing. I think most woman pop into the bathroom in hopes of having at least two minutes to do their thing before someone knocks and yells “Moooooom”. And every woman with children will tell you the little ones have a special radar tuned in to their mom. It doesn’t matter how engrossed they seem in activity, all it took for me to get their attention was to pick up the phone, lean my head back and close my eyes for a couple of moments or shut the bathroom door … those little angels came running with some desperate need that had to be fulfilled at that moment. But men? Men seem to find their zen in the bathroom. Guys gather a couple of magazines, the daily newspaper and the mail before heading in for their “quiet” time. And EVERYONE knows it’s best to steer clear of that corner of the house for several hours after that door opens and the green fog drifts away. Now, my guilty pleasure? Soaking in the tub with some fancy candles burning around me and slipping into the lovely water with a wonderful book (and a glass of wine). *sigh* Since I was a library gal prior to being a writer this meant worrying about ruining a library book. When I started buying my books there was less worry, but still I had to be diligent about making sure the pages didn’t curl from the steam rising off my bubbles. With the advent of e-readers bathroom reading is even easier. Slipping that e-reader into a gallon sized baggie allows one to read without worry of getting the reader wet. And flipping those pages from one hot scene to another? Easy peasy. So grab that book, a glass of wine and some candles and settle in for a long hot soak in the tub. Just tell the family you’re doing something like re-wallpapering the bathroom walls or scrubbing the floor … anything that doesn’t involve relaxing. Because you know they won’t leave you alone if they think you’re not busy! So curiosity has me asking … are you a bathroom reader? I’m a bathroom reader. I used to wonder how people did it, now I know. 🙂 So there you go, I just ousted myself. LOL! Yep, you sure did!